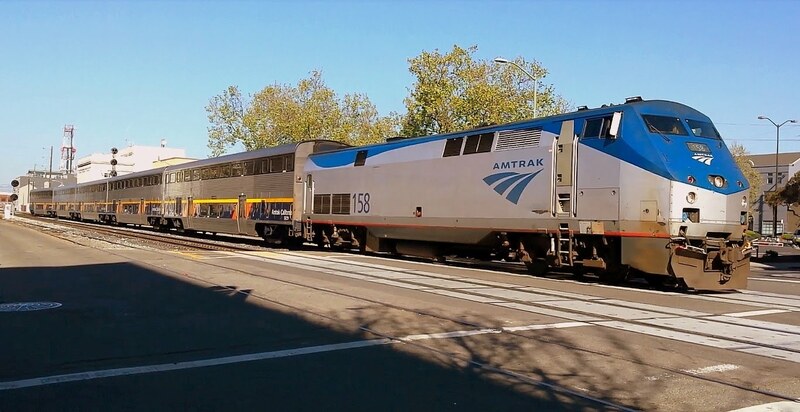 Stockton Calif. – In anticipation of the busiest travel period of the year, Amtrak San Joaquins is preparing to accommodate the expected surge of holiday travelers with increased capacity on both trains and thruway buses. The San Joaquins service will add seats beginning Wednesday, Nov. 23, through Sunday, Nov. 27. Amtrak will also be increasing the number of reserved Thruway buses on its busiest California routes, including Martinez-Arcata, Sacramento-Chico, San Jose-Grover Beach, Sacramento-Stockton, Bakersfield-Los Angeles, and Santa Barbara-San Luis Obispo-San Jose. · Book Early! Tickets sell out quickly, especially those for Thruway bus service, so customers are encouraged to plan ahead and book tickets early for best availability and pricing. Travelers may purchase tickets on Amtrak.com, Amtrak mobile apps, or by calling 800-USA-RAIL. · Baggage: Amtrak has the friendliest baggage allowance in the travel industry. Customers can bring two bags and two carry-ons, collectively weighing up to 150 pounds, for free. · Avoid the Rush: The busiest travel days are the Tuesday and Wednesday before Thanksgiving and the Sunday after the holiday. Other than Thanksgiving Day, morning trains typically have more seats available than those in the afternoon or evening. · Arrive Early: Allow plenty of time at stations prior to departure – at least 45 minutes beforehand if picking up tickets. Arrange for pre-boarding if you need extra time or assistance. · Bring your Bike: Some places are meant to be explored on two wheels. Reservations are not required on the San Joaquins. · ADA Friendly: Amtrak welcomes all passengers with disabilities. Trainsets and conductors are prepared to make your travel experience comfortable and seamless. · Carry Photo ID: Customers are required to show valid photo identification when purchasing tickets. Make sure to carry valid photo ID at all times, as it may be requested aboard trains. · Be Safe: Passengers should be aware of their surroundings, stand back from the edge of the platform, do not leave your bags unattended, and watch your step when boarding or leaving the train or when walking between cars when the train is in motion.